The heart of the nation, Java is an island of megacities, mesmerising natural beauty, magical archaeological sites and profound traditions in art, music and dance. Boasting a dazzling array of bewitching landscapes – iridescent rice paddies, smoking volcanoes, rainforest and savannah, not to mention virgin beaches – most journeys here are defined by scenic excesses. The island is at its most excessive in the cities: crowded, polluted, concrete labyrinths that buzz and roar. Dive into Jakarta's addictive mayhem, soak up Yogyakarta's soul and stroll though Solo's batik laneways en route to the island's all-natural wonders.Home to 140 million people and the most populated island on earth, Java travel can be slow going, particularly in the west. However, the rail network is generally reliable and efficient, and flights are inexpensive. Your endurance will be rewarded with fascinating insights into Indonesia's most complex and culturally compelling island. 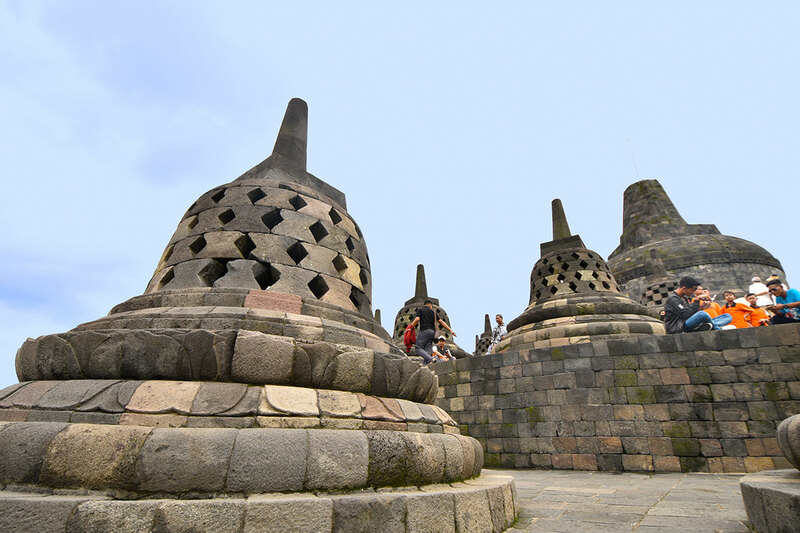 The world's largest Buddhist temple and one of Indonesia's biggest attractions is Unesco World Heritage–listed Borobudur Temple. It's built from two million stone blocks in the form of a massive symmetrical stupa, literally wrapped around a small hill. Standing on a 118m by 118m base, its six square terraces are topped by three circular ones, with four stairways leading up through carved gateways to the top. Viewed from the air, the structure resembles a colossal three-dimensional tantric mandala (symbolic circular figure). Rising from the guts of the ancient Tengger caldera, Gunung Bromo (2329m) is one of three volcanoes to have emerged from a vast crater, stretching 10km across. Flanked by the peaks of Kursi (2581m) and Batok (2440m), the smouldering cone of Bromo stands in a sea of ashen, volcanic sand, surrounded by the towering cliffs of the crater’s edge. Just to the south, Gunung Semeru (3676m), Java's highest peak and one of its most active volcanoes, throws its shadow – and occasionally its ash – over the whole scene. The vast majority of independent travellers get to Bromo via the town of Probolinggo and stay in Cemoro Lawang where facilities are good. There are other options in villages on the road up from Probolinggo. Additional approaches via Wonokitri and Ngadas are possible.